Alder Hey hospital, located in Liverpool, is one of Europe’s busiest children’s hospitals. Originally founded in 1914, Alder Hey hospital was the first hospital in the UK to test penicillin in 1944, and to establish a neonatal unit. Today, 2400 staff care for more than 275,000 children and young people each year. In March 2013, construction began on a brand new £273m hospital facility in Springfield Park adjacent to the old hospital. Completed in September 2015, the new facility will have 270 beds, including 48 critical care beds together with 16 digitally enhanced operating theatres. However, as the new hospital neared completion, hospital managers faced a problem – What was going to be the best way to move patients, and equipment from the old hospital to the new facility? Alder Hey Children’s Hospital turned to SafeRoute to provide a 200 metre long protective tunnel to link the old and new hospitals. Saferoute have been designing, manufacturing and installing their modular fire rated pedestrian protection tunnels since 2007. The Saferoute tunnel, which includes vinyl flooring and is fully lit, allows patients, staff and equipment to be moved between the old and new hospitals in a safe and controlled environment. It was important that the temporary pedestrian tunnel was completely weatherproof. 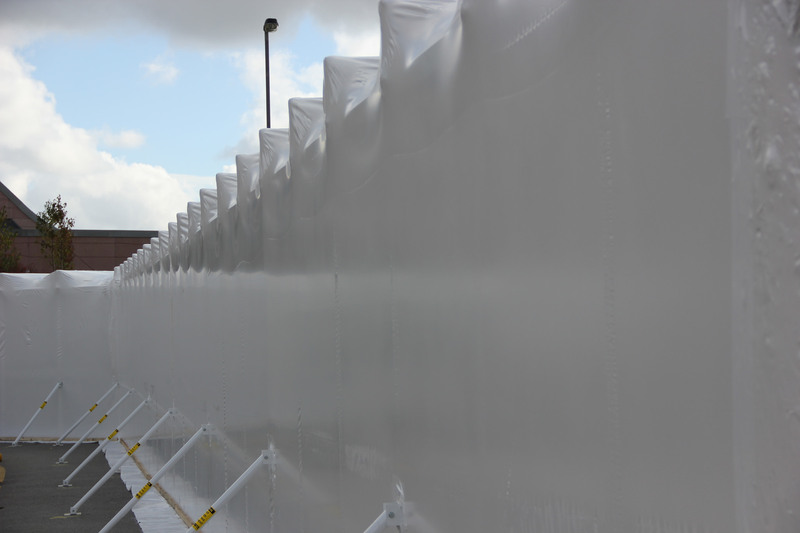 To this end, Rhino Shrink Wrap were tasked with installing our industrial grade shrink wrap sheeting to provide complete weather protection whilst maintaining a smart appearance to the tunnel exterior. Shrink wrapping a pedestrian tunnel can be challenging. Firstly, the shrink wrap sheeting must be firmly secured around the tunnel structure. This means that when hot air is applied, the sheeting will mould very tightly around the tunnel, and not simply lift up. When encapsulating scaffold structures, the shrink wrap is straightforward to secure; it is simply overlapped around a scaffolding tube by around 30-40cm and then heat welded back on to itself. However, when wrapping a large object such as a modular building or a SafeRoute tunnel, securing the film is not always so straightforward. Sometimes it is possible to fully wrap and encapsulate an object, including the underside, but for this project Rhino technicians installed a wooden batten to the steel frame around the bottom of the tunnel using Hilti self tapping fixings to which the shrink wrap could be fixed. The final part of this ‘preparation phase’ was to pad any sharp edges around the tunnel. 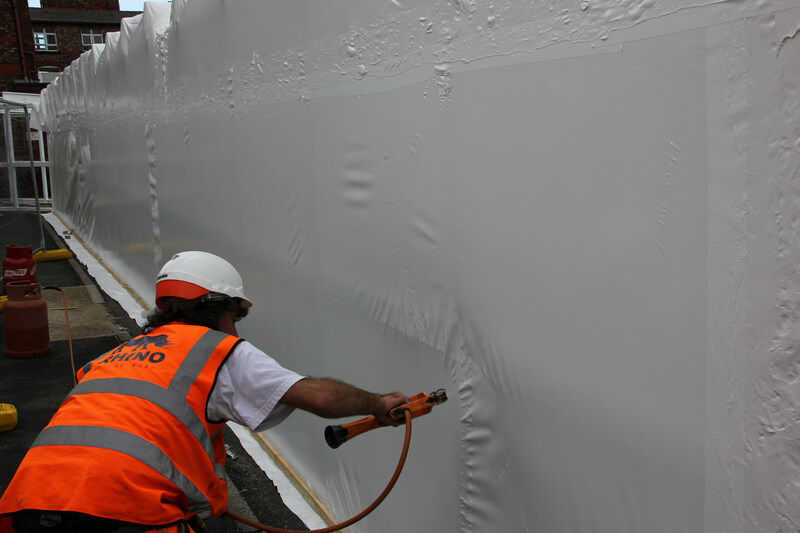 To provide weather protection to the tunnel, Rhino used our ‘signature’ 300 micron thick shrink wrap film. Although it is possible to manufacture shrink wrap in a variety of widths, we typically use a 7 metre wide x 15 metre long shrink wrap plastic roll. This size of roll is convenient to handle and still enables up to 100 square metres to be covered per roll. The protective sheeting is flame retardant to the European EN13501 standard but LPS1207 or LPS1215 certified sheeting is also available. The 15 metre roll length was used along the length of the tunnel to minimise the number of joins between sheets that would be required in the roof. When installing any kind of temporary roof, joins between sheets should be minimised. Where joins must occur, it is important to ensure that water cannot pool in that area, and can drain away freely. Although the 7m roll width was not sufficient to go up and over the tunnel in a single sheet, which would require 9 metres of sheeting, one of the benefits of using shrink wrap sheeting is that it is very easy to join sheets so that there is no limit to the size or shape of object that can be covered. Once the sheeting had been installed over the tunnel, the final stage for the installers was to shrink the cover ‘drum tight’. As well as presenting a very smart and professional appearance to the finished sheeting, because the shrink wrap fits very tightly it is highly resistant to flapping and detaching. 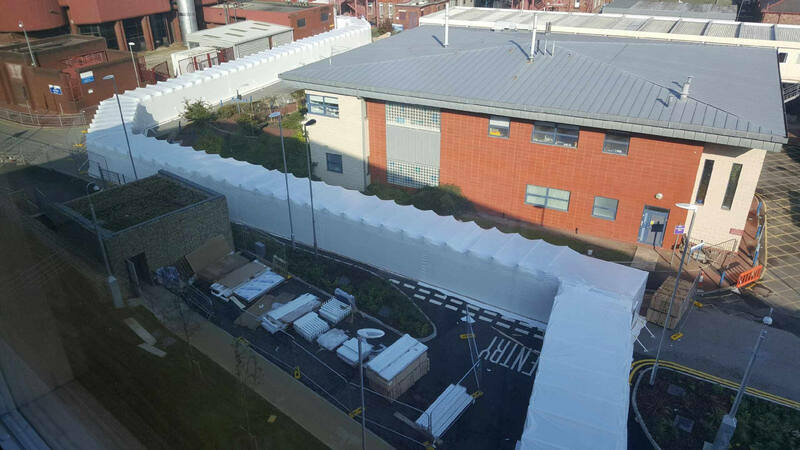 In total, a team of 3 Rhino Installers spent 1 week installing shrink wrap encapsulation around 1800 square metres of tunnel for SafeRoute and Alder Hey Hospital. Heat sealed joints between sheets created a completely encapsulated tunnel. Smart appearance for a high profile project. Allows lots of light through the roof covering for pedestrians using the tunnel. Versatile – moulds to the shape of the tunnel and around tunnel twists and turns.